This tutorial requires the Base and Explorationist modules. If you haven’t done so already, please see our earlier tutorial: Create a Wedge Model. 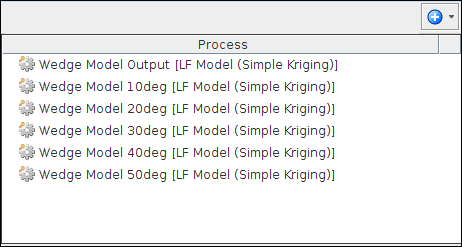 In our previous workflow, we created a synthetic model using an “LF Model (Simple Kriging)” and these settings. This model is calculating synthetics at an angle of incidence of 0 degrees. At this angle, the synthetics are calculated using the reflectivity from P-Impedance only. To investigate AVA effects, we will need to model synthetics at angles greater than 0. Let’s create the additional angles. Repeat these steps for each angle from 10 to 50. Right-click the “Wedge Model” process, choose Create Copy. Name it “Wedge Model 10deg”. Set the Angle of Incidence to 10 deg. Repeat for angles 20, 30, 40, 50. Because these are Insight processes, the results are available immediately and they use almost no storage. Each process creates four models (P, S, Rho, Synthetics), so our Volume tab will be quite full. I’ve organised the result volumes using folders to tidy up. Comparing the results is easy. 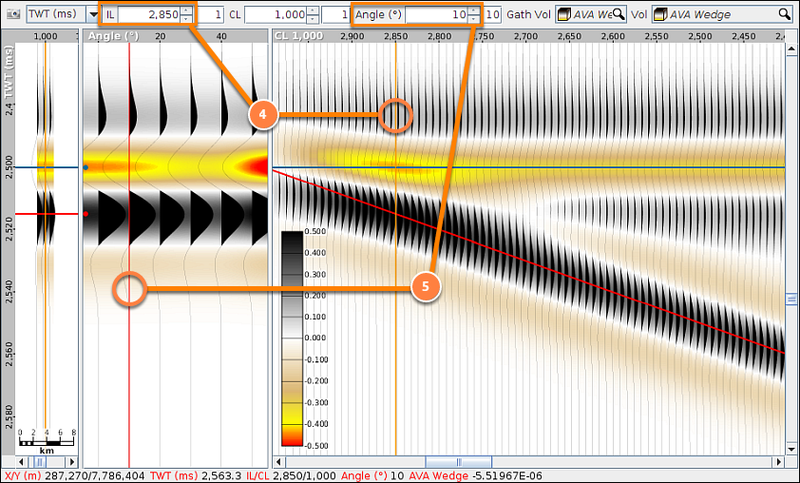 Switch between the different synthetic angles using the volume selector, or by using the Page-Up / Page-Down keys. Let’s take these wedges into the next dimension. We’ll construct angle domain gathers from the results using a “Create Gathers” process. Enter the angle and choose the appropriate volume. In the Control Panel, choose new IL/Gather/CL view. 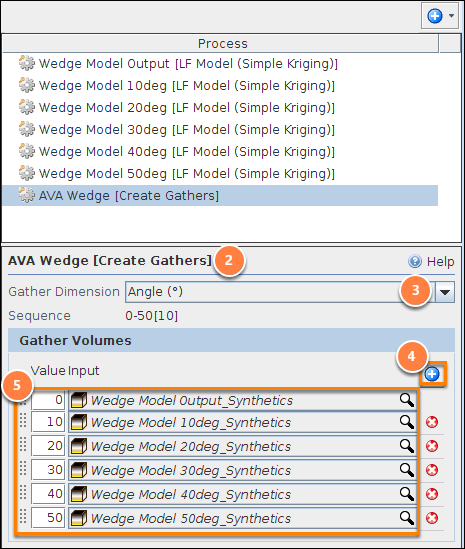 In Vol, choose the AVA Wedge gather volume. In Gath Vol, choose the same AVA Wedge volume. 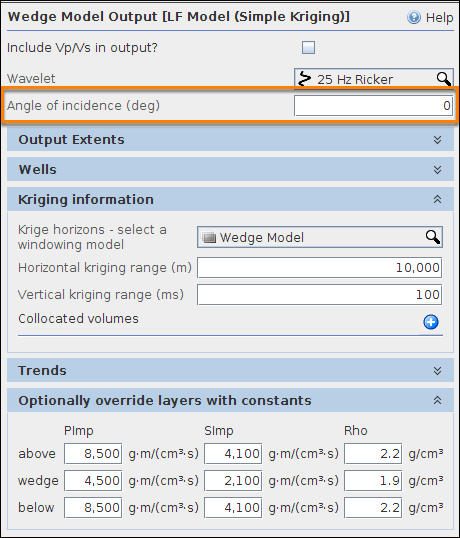 Adjust the vertical intercept in the right-hand stack panel to select the thickness of the wedge displayed in the gather. This adjusts the “IL” location. The wedge thins with increasing inline value. Adjust the vertical intercept in the centre gather panel to select the angle displayed in the stack panel. This adjusts the “Angle” location. This is a really interesting result! In the gather panel, we can see that the amplitude dims with angle, until it reaches 30 degrees, where it begins to brighten again. As always, all of the parameters are adjustable and the results update on the fly. Replace the wedge horizons with actual top and base picks from a known formation.